Just acknowledging that Super Tuesday happened. Yes, I invited some people over to watch election returns and eat ice cream. Who wouldn't? But as far as political commentary, I'm just watching along with everyone else. 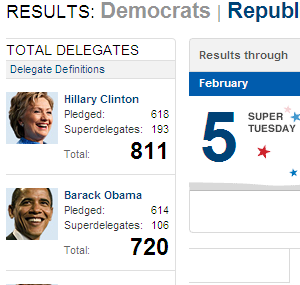 A little confused on how CNN is showing Clinton with the most delegates, but Obama is claiming the opposite. Noticed Huckabee opened his speech last night with Biblical allusions, comparing himself to a "small smooth stone" and his campaign's budget to a "widow's mite." He didn't say anything more direct - I wonder how calculated his religious statements are by his staff - "just enough to be recognizable by evangelicals, but not enough to scare anyone?" Though he said he's still in it (indirectly claimed Romney is out of it), most people are saying he can't win (though here's a random comparison of him and the movie The Passion of the Christ). Time Magazine's five quick thoughts from yesterday. 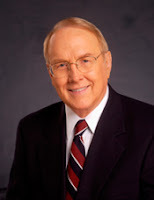 And ultra-conservative James Dobson declared yesterday morning he would - under no circumstances - vote for McCain. With McCain's clear win, Dobson has probably proved his waning influence. I'm not a fan in the first place, but I'm even more disappointed when a Christian leader associates political process things like judicial filibuster in the senate (which McCain helped preserve) as negative - almost immoral. As if it is not conservative or even not biblical. Neither characterizations make sense. And you've gotta think he'll support it as soon as it's used to block a liberal judge he is not in favor of.